Edward Karlow is a screenwriter and novelist. He studied at the University of Minnesota, winning several prizes including the McKnight Fellowship for Screenwriting. For Theresa and Max, being together on Echo Island is dangerous, even deadly. From the start, fifteen-year-old Theresa senses that the mysterious Max is hiding a huge secret. He unnerves and intrigues her, and even as she fights illegal polluters, she’s irresistibly drawn to him. Soon they are bound together by his deepest secret. Their fight to protect the lake leads them to underwater caves, ancient paths, revealed mysteries, and a spontaneous kiss. But will they make it off the island with their lives? I spent almost five hours in a Vehicle of the Oppressor: my parents’ gigantic gas-guzzling sports utility vehicle. It was oppressing me and our little planet as I sat next to my older brother, Derek. He and I tried to get along, but we were brother and sister, so we fought and argued. “Reesie, are you thinking about all the fossil fuels we’re using on this trip?” he asked. “You, Teresa, the prima diva,” he teased. “You’re so original,” I argued back. “So, are you obsessing about gas mileage or what?” He pushed the subject more. “No, I’m not,” I responded. “I knew it! You can’t hide it. It’s written all over your face,” he gloated and went back to studying graphs and numbers on his laptop. Like I said, Derek and I fought a little. Okay, we were constantly tearing each other apart verbally, but brothers and sisters were designed that way. Right? Blatherskite. That was the name I gave him. I study weird, outdated scientific words, mostly to make Derek annoyed with me. A blatherskite was a person who talked at great length without making much sense. He was most defnitely one. Anyhow, our parents drove us north of the city, into the middle of the woods, where there were gigantic pine trees and empty windy roads. We even passed a small bait shop that sold worms and minnows and beer. Everyone drove pick-ups and there were handmade signs for boat storage and snowmobile repairs every mile. My mom insisted that we blast the air conditioning, but I cracked the window for fresh air that wasn’t all smoggy, like in the city. I’m so sick of pollution and plastic and the way everyone treats our planet, tired of being fifteen and having all the adults in my life tell me what to do, but turn around and watch the Earth be destroyed. But who was I to say what was right? And who wanted to hear me lecture? Nobody likes to be preached at. Plus, I don’t even know who I am. I’m still trying to figure that out. I don’t really ft in with one group, I know that much at least. Part of me gets along with the athletic group because I’m outdoorsy, but the other part of me wants to go “goth,” because there’s so much doom and gloom to be found. I’m not ready for black lipstick, but I’m not ready to join a sorority either. I don’t own one of those remove-your-makeup headbands that some girls wear. I’m not a fashion-obsessed pink-polka-dot-wearing girl. Definitely not. I don’t think I’ve worn a dress since I was six. I like to think I could ft in with all groups or cliques or whatever, but in reality, I don’t ft in with any of them. So I take a little from each group and make it my own. I like black combat boots and extra eyeliner, but I also can be found in an outdoorsy fleece jacket and a bike helmet. It confuses people (including myself) when you don’t ft neatly into one specific box. I try to place myself outside the box. I don’t know. It isn’t easy. That’s probably why I only have one good friend, Brooke. We’ve been friends since we were five. We bonded by studying worms and insects on the kickball field. The classic we’re-both-nerdy-outcasts-so-let’s-stick-together style friendship. Being a nerdy outcast, I’ve only had one ex-boyfriend, Trevor. More about him later. I shouldn’t have even brought him up. My parents are dropping Derek and me of at my Aunt Kat’s house on the island, where we’ll be staying for almost two weeks. Kat’s real name is Katherine, but only my mom calls her that. Mom and Dad are going on a rich-fancy-friend cabin thing where they don’t want two teenagers hanging around. A short escape for my parents’ latest obsessions in the city. I didn’t know it, but my life was about to do a complete 180 from where I was in the back seat with my brother. There was no way I could have known I was a week away from risking my life. That I would see so many things I couldn’t believe were real. That I would discover secrets that weren’t just dangerous but truly magical. And that I was going to feel something for someone, an event that I had only read about. I was about to actually live an exciting, wild life instead of watching others’ adventurous lives from the sidelines. But back to my Aunt Kat. She’s nothing like my parents: she’s fun and cares a lot about the little island she lives on up in the woods. She’s fit, has a couple tattoos, wears cut-of jeans, plaid shirts, and a beat-up straw hat. It’s even rumored that she won some kind of beer drinking contest at the Sturgis Motorcycle Rally in South Dakota when she was younger. “That was twenty years ago,” she’d always say when I’d ask her for details on her beer championship. “Please tell me,” I’d plead. “Maybe when I’m older, you can tell me?” I’d ask. Now, she owns her own supper club, Kat’s Club, and everyone on Echo Island knows her. She’s not detached and afraid to talk to her neighbors like my upstanding leader-type parents, the lovely Jim and Linda Clarke. And she didn’t freak out when I told her that I was a vegetarian, or that I once chained myself to a tree to protest some new condos, or that I saved my yogurt containers to re-use for my leftovers. Aunt Kat visits us in the city about once a year. She stays with us and makes my parents a little nutty with her unconventional ways. She cooks us crazy healthy meals and brings progressive ideas into our home. Once, she even planted an entire vegetable garden on our front yard while my parents were at work. That was a memorable visit for our suburban street. Each time, she’d demand that we come back to the island and visit her. We had just never found the time until this year. Who am I? I’m Teresa Clark. I’m fifteen. I like science and saving the environment. I’m not into love and romance and testosterone-flled boys who pretend they’re already men. I was into love and romance for a little bit. His name was Trevor Jacobson. I didn’t like Trevor at first, but then he grew on me. And by the time I really liked him, he decided he didn’t want to see me anymore. He wanted to see Brenda Jenson instead. Brenda Jenson was nice and blond and smelled like expensive perfume. I wasn’t always that nice, not blond, and I didn’t like spraying myself with expensive chemicals. Thinking about him or even saying his name made my stomach hurt. I had already lost enough sleep over him. So romance? I was going to pass on that for a little while. Maybe a long while. members, but we’re super active. We set up a table once a week at the grocery store to encourage people to recycle their plastic, glass, and paper. Successful or popular? No. But it’s what we do. I sometimes get us in trouble, but Brooke gets us out of it. She’s smart and her thick-rimmed glasses give her an authority that adults trust. I started wearing a fork necklace around town recently, sort of like carrying your own water bottle. It’s just a metal fork with a hole drilled in it and a chain. That way, I don’t have to use plastic forks when I eat out. I pretend it’s my badge of honor, a way to show I support the planet. I hope to start a revolution of fork necklace wearers, but I’m not sure it’s working. My brother Derek thinks it’s gross, but he’s only interested in studying business management or investment banking or something. What was grosser than that? Plus, I wash the fork all the time, so it’s not really that gross. Plastic forks winding up in our oceans and rivers? That’s what’s gross to me. What was doing on Echo Island? Waiting tables at Kat’s Club. My brother was going to balance her books or figure out a business plan or something business-like and boring. He was good with numbers. I was too, but I had bigger fish to fry. We stopped at a small gas station in the middle of nowhere and hopped out to stretch. Derek grabbed another can of soda and threw the plastic six-pack ring on the ground. Besides gigantic gas-guzzling cars, those plastic six-pack rings were another big enemy of mine—a sign of the apocalypse. I’ve already lectured him on what those six-pack rings can do to animals if they get one stuck around their necks. I picked it up and put it in my pocket, so I could cut it up and recycle it later. “There it is,” my mom said and pointed. I shielded my eyes from the sun and observed the lake. We could only see a sliver of it, because there were pine trees everywhere, but I could see the island, miles away. It looked like a little dot on the big lake. I crossed the street to get a better look at the island. I saw a figure, a guy waterskiing. I focused on him as if I had used a telescope. He seemed around my age, and he stared me right in the eye for a second. He went by so fast, but his intense eye contact caught me of guard. I couldn’t tell what was going on. It didn’t look like he was wearing skis. He had a bright-colored swimsuit, that’s about all I could tell. “What are you looking at?” Derek surprised me. I jumped a little. “Quit sneaking up on me!” I complained. “What’s out there?” he asked. “It’s called barefooting, genius. I thought you knew every outdoorsy sport there was,” he teased. “What’s going on?” My mom joined us. “Teresa thinks she saw someone barefooting, but I don’t hear a boat or anything. I think the fresh air’s gone to her brain,” he said. “Funny, fresh air helps you think better, it doesn’t make you hallucinate,” I responded. “I think you were seeing things,” my mom added. “Huh?” I said, slightly annoyed. “This part of the lake doesn’t allow motorized boats—” she answered, but was interrupted by Derek, the Neanderthal: “What the hell’s with all this ash in the air?” We all looked up to see campfire ash floating in the sky. “Let’s get out of here, before we have to breathe this crap into our lungs,” Derek complained. “For once you’re interested in the air quality?” I said. “Whatever, get over yourself,” he retorted. My mom rolled her eyes at our bickering and they both hopped into the car. I started to follow, but turned again to watch the ash float to the ground. I held my hand out and a piece of ash landed on it. It had a light blue tint to it. I looked closer. It was a snowflake. “Snow?” I whispered to myself. How could it be snowing in mid-July? I squeezed my hand shut to see if it would melt in my palm. I opened my hand back up and it had melted. It really was snow! I thought to myself. I hopped back in the car next to my brother. “Doesn’t that look like snow out there?” I asked, afraid to admit that it had just melted in my hand. “Snow in July? Right,” Derek said and covered his ears with his headphones. ping, not magic lakes,” she said. I touched the window and watched all the ash or snow or whatever it was disappear as we drove away. ways happened to me there, I have to admit. And I’ve had the most vivid dreams of my life at your aunt’s house,” my mom added and stared out the window. She opened it and held out her hand to play with the wind. I said my goodbyes to my parents and settled in here in Aunt Kat’s attic guest bedroom. Derek wanted the big guest room, but that’s okay, because I like attics. I stayed in this attic when I was five and loved it even then. This cozy attic was one of my earliest memories of my entire life. I could recall little from when I was five, but this room and this feeling I remembered. Echo Island was a lot smaller than I thought it was. There was one major road that circles it and a round trip would only be about five miles. There wasn’t a bunch to do here, but I guess that’s why older people liked it. They’re able to relax. It was easy to find a beach; they were all over the place. Kat’s Club was one of the most popular spots and everyone on the island seemed to love her. My parents used to be a lot closer to Aunt Kat and we stayed here once as a family. I think she was too much of a rebel for them. She did her own thing and said whatever she wanted; she wasn’t afraid of anything or anyone. Our family was always too busy to come up to the island after we got older, so we stayed in the toxic polluted city. “Someone has to pay for the roof over your head,” my always-wearing-khakis dad would say. Echo Island wasn’t a place I should have liked, but I loved it when I was five and I fell back in love once the island came into view from the water. I was a science and nature girl, but I lived in the city. There was so much open space here. So much water and so much nature. I spend a lot of time fighting for nature, but in truth, I didn’t spent too much time in nature. Aunt Kat had electricity and warm water, but there was no mall, movie theater, or car dealership on the island. As you might have guessed, I wasn’t into malls. Aunt Kat said there was only one spot on the island to get a good cell phone signal, but I didn’t have many people to text, except for Brooke. She was back in the city, fighting the good fight for our club. New boys? There were no boys to text. Boys were annoying and distracting and after Trevor, I needed a break. It’s all so obvious what was going on in their brains. I’ve read all about it and it all boiled down to a scientific explanation. Like kissing. Even kissing was science; I had studied it. I read that kissing was a way for the male to pass on testosterone to the female. Her libido would spike and that would lead to more kissing and then babies and a family. It was only a bunch of chemicals flying around in your brain: dopamine, serotonin, oxytocin, and vasopression. The “Love Lock” bridge in Paris? All these lovey-dovey couples attaching padlocks of love to the sides of a poor little bridge. Gobs and gobs of padlocks from couples. So many that they almost made the bridge collapse. Forty five tons of locks! City workers had to risk their lives removing the bridge’s panels. What did love do for us? It was plain dangerous and should be avoided if you ask me. Look how much work I could’ve gotten done if I wasn’t at home, sad and depressed over Trevor. Where did it get me? Okay, off to bed. Not another word about Trevor or love or dopamine or Paris. Thank you Edward for sharing! 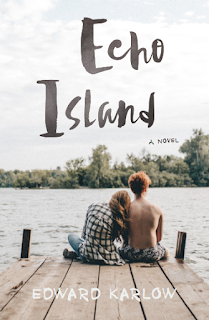 Readers, check out Edward's website for more information about Echo Island!